Michael Griffin NASA - Solar System Planets And Moons Section. Michael Griffin takes the helm at NASA. 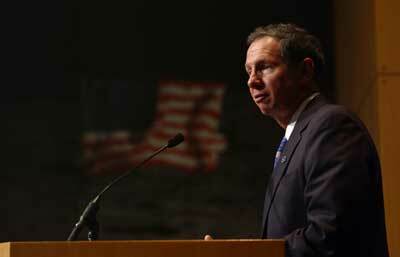 Michael Griffin addressed NASA employees on Thursday, when he became the 11th Administrator for the space agency. In his address, Griffin said he would focus on getting the shuttles ready to return to flight, and continue to fulfill the Vision for Space Exploration, which sees astronauts returning to the Moon and eventually continuing on to Mars in the coming decades. Griffin was nominated by President Bush on March 14, and was confirmed by the Senate on April 13. Michael Griffin is returning to NASA as the Agency's 11th Administrator. "I have great confidence in the team that will carry out our nation's exciting, outward-focused, destination-oriented program," said Griffin. "I share with the agency a great sense of privilege that we have been given the wonderful opportunity to extend humanity's reach throughout the solar system." Administrator Griffin, who served as NASA's Chief Engineer earlier in his career, takes the helm of the Agency as it's charting a new course. The Space Shuttle fleet is poised to Return to Flight, the first step in fulfilling the Vision for Space exploration - a bold plan to return humans to the Moon, journey to Mars and beyond. In his first address to NASA employees, Griffin said he would focus immediately on Return to Flight efforts, and noted that the Agency has much on its plate right now. "It's going to be difficult, it's going to be hectic, but we will do it together," he said. He also told employees that he saw "nothing but cheers" in the public reaction to the Vision. "People want a space program that goes somewhere and does something," he said. Griffin was nominated by President George W. Bush on March 14, 2005, and confirmed by the United States Senate on April 13, 2005. At his confirmation hearing on April 12, he made clear that the "strategic vision for the U.S. manned space program is of exploration beyond low Earth orbit." In his statement to the committee, Griffin said, "It is a daring move at any time for a national leader to call for the bold exploration of unknown worlds, a major effort at the very limit of the technical state of the art," adding later, "in the twenty-first century and beyond, for America to continue to be preeminent among nations, it is necessary for us also to be the preeminent spacefaring nation." A holder of five master's degrees and a Ph.D., Griffin also made clear that, despite limited resources, "NASA can do more than one thing at a time." "My conclusion is that we as a nation can clearly afford well-executed, vigorous programs in both robotic and human Space exploration as well as in aeronautics. We know this. We did it," he said, referring back to the Agency's accomplishments during the Apollo era. He closed his statement with a call for exploration: "I believe that, if money is to be spent on space, there is little doubt that the huge majority of Americans would prefer to spend it on an exciting, outward-focused, destination-oriented program. And that is what the President's Vision for Space exploration is about." Earlier in his career, Griffin served as chief engineer and associate administrator for exploration at NASA Headquarters and also worked at NASA's Jet Propulsion Laboratory. He also served as Deputy for Technology at the Strategic Defense Initiative Organization. Griffin received a bachelor's degree in physics from Johns Hopkins University; a master's degree in Aerospace Science from Catholic University of America; a Ph.D. in Aerospace Engineering from the University of Maryland; a master's degree in Electrical Engineering from the University of Southern California; a master's degree in Applied physics from Johns Hopkins University; a master's degree in Business Administration from Loyola College; and a master's degree in Civil Engineering from George Washington University.